The House has turned down measures that could have opened retail stores, liquor stores and bars earlier on Sundays. Right now, they can’t open until noon. One bill would have had local governments decide of the retailers could open early on Sunday. The Senate Judiciary Committee took nearly three hours of testimony – some of it emotional – on a bill to prohibit discrimination based on sexual orientation. Supporters say members of the lesbian, gay, bi-sexual and trans-gender community face discrimination in hiring and housing – because of their orientation. A bill that was “fast-tracked” to get $720-million to the state Department of Transportation for the 2013 road construction season is now law. Gov. Jack Dalrymple signed the bill Monday in a ceremony at the state Capitol. "It is really a true testament to the fact that this Legislature can and will move very efficiently and very nimbly when they need to," said Dalrymple. This means contractors can start bidding for identified projects. DOT interim director Grant Levi says the money is definitely needed. A Grand Forks lawmaker says it's time for a new state license plate. "The last general issue we had in North Dakota was in 1991," said Sen. Ray Holmberg (R-Grand Forks). "So the plates are up to 21, 22 years old." Holmberg says the older plates are becoming unreadable. And he says there is now technology for license plates. "The new plates are flat, and they are a material that is much more reflective than we have now," said Holmberg. "It's good for everyone to have a license plate that can be read." The President of the Board of Higher Education says there’s a lot of misinformation circulating about the new information technology building being built at UND. The Legislature approved that building to consolidate I-T serves system-wide. But a report surfaced that part of the building would be used for an office for the Chancellor of the University System, as well as a board room, a reception area and a kitchenette. And lawmakers are raising questions. 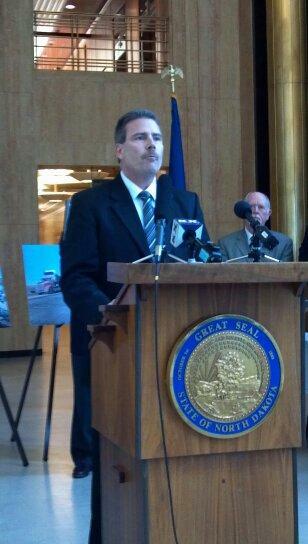 State Sen. Dwight Cook (R-Mandan) has introduced a bill that re-structures the state’s oil tax. Cook’s bill changes the so-called “stripper exemption” for low producing oil wells drilled after July First. It requires oil companies to withhold income taxes from non-resident oil royalty owners. It provides an incentive for companies to drill outside the Bakken and Three Forks formations. And, effective January first, 2017, it permanently lowers the oil tax rate from 11.5 percent to 9.5. The sponsor of a measure limiting law enforcement use of unmanned aerial vehicles says he’s concerned about privacy rights. Rep. Rick Becker’s (R-Bismarck) bill says law enforcement must get a search warrant – before using the “drones” for surveillance. "If UAS is to be used for surveillance of private citizens, they need to get a search warrant to use the drone," Becker told the House Judiciary Committee. "That's opposed to using the drone to obtain information to get a search warrant. That's a very clear distinction."